Arrh! Tis a mighty fine review for a treasure of a tale! Aye, tis worth its weight in pirate’s booty. And so are you, Ronna! 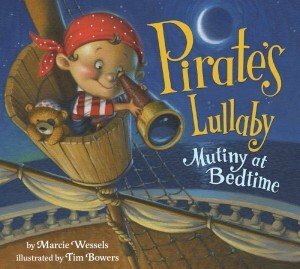 Thank you so much for reviewing Pirate’s Lullaby. Hooray ! It’s here! I so love this story. What a lovely review, too! I thank ye, Lassie. Tis a fine yarn, it is! I wrote the first draft of Pirate’s Lullaby in Sarah’s class. She saw its potential and encouraged me to keep working on it. Thank you for your keen eyes, Sarah, and thank you for cheering me on! Thanks for stopping by, Sarah. Where’s your class? Sarah teaches at UCSD Extension. She offers three different classes – Writing for Children 1, Writing Children’s Picture Books and Writing for Children 2. All of the classes are part of the UCSD Extension Certificate Program in Writing for Children. There is also a program for Children’s Book Illustration. Yo Ho Ho! Me thinks the release of this PB booty must coincide with “Talk Like A Pirate Day”. Shiver me timbers! What a great guess! My official San Diego launch party is being held on 9/19, which is, as you know, Talk Like A Pirate Day!